Vogue Germany has been pretty solid throughout 2017, producing a series of strong covers featuring the likes of Saskia de Brauw, Christy Turlington and Vittoria Ceretti (we’re willing to overlook the Claudia Schiffer disaster in September). The magazine closes out the year on a high note, giving us exactly what we crave for a December cover: glamour, style and a touch of festivity. Diane Kruger makes a return to the title, three years after her last cover, and receives the full Luigi & Iango treatment. Serving extremely good face, the actress wears a glitzy feathered and embellished Alexander McQueen number. The cover ultimately received mixed feedback from our forum members. “Easily her best cover, out of the four she has done for them. Stunning,” declared Miss Dalloway immediately after seeing the cover. “Stunning! I can feel the festive vibe,” added IndigoHomme. Everyone else seemed to sniff out major signs of airbrushing. “Pretty, but she barely looks like herself, reminds me a bit of Malgosia Bela,” Nymphaea pointed out. “She looks like Adele to me! Totally flavorless cover, a bit like her actually,” Les_Sucettes snarked. “Typical Luigi & Iango, turning their women into mannequins,” noted Benn98. 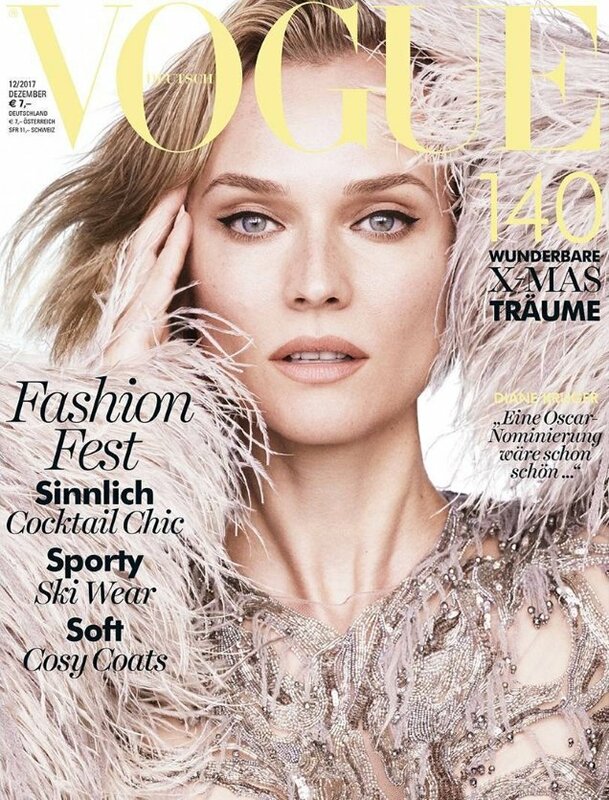 “It’s great of Vogue Germany to feature her again! She looks beautiful but I agree that it’s too Photoshopped,” echoed dodencebt. Await the contents of the issue and join the debate here. Where’s the Spirit in Alicia Vikander’s Louis Vuitton ‘Spirit of Travel’ Campaign?Edward Enninful’s First British Vogue Cover Is Finally Here — and It’s Stunning!